While some mothers may like to be taken out to dinner on Mother’s Day many fathers like the chance to fire up the grill. It’s no different in my family but one thing that must go along with the grilled entree is some kind of potato. It doesn’t really matter what kind, baked, french fried, hash browns, oven roasted or potato salad if it’s potato it’s all good. 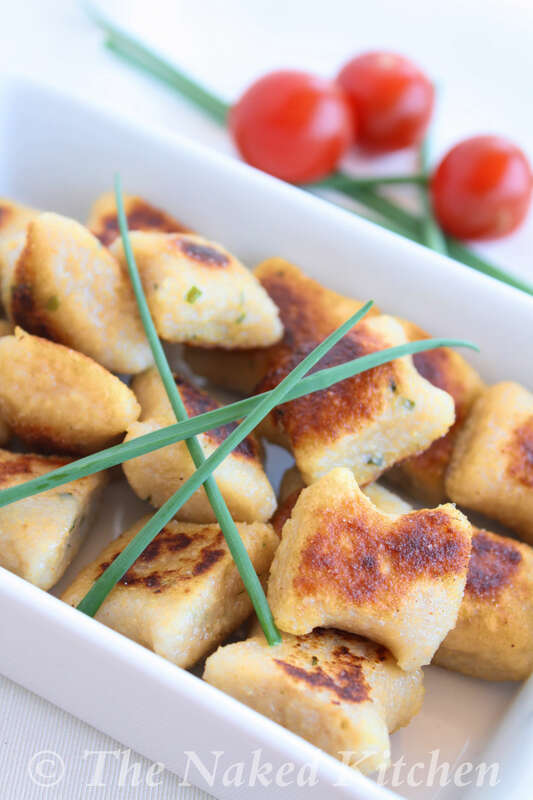 This year I decided I wanted to have something a little different so I made these delightfully chewy little dumplings and previewed them last week for a little taste testing. They were a big hit and will definitely be a part of our Father’s Day menu! One thing I like is that they can be made ahead of time and then fried just before serving so you can spend time with your family and not in the kitchen preparing food. I hope you enjoy and have a Happy Father’s Day. 1. Cut potatoes into chunks and cover with water. Add 1/2 tsp salt and bring to a boil. Reduce heat and simmer until the potatoes are tender, approximately 15 minutes. Drain and let cool until able to peel off the skin. Rice with a potato ricer or process in a food processor until smooth and there are no lumps. 2. Transfer to a large bowl and add 1 1/2 cups of flour, 1 tsp salt. milk, chives and garlic. Mix well and then add more flour as needed until you have a soft yet firm dough. The dough should hold together but not be sticky. Divide into 4 equal pieces and form into balls. Cover and let rest 3-5 minutes. 3.Fill a large pot with water and the remaining 1/2 tsp salt. Bring to a boil. While the water is heating lightly flour a dry, flat surface. Channel your inner child or get your children to help you roll 1 ball of the dough into a 1/2 inch thick rope just like when you used to play with play dough. With a sharp knife cut the rope into 1/2 inch pieces. Drop the dumplings into the boiling water and simmer for 3 minutes. 4. Scoop out with a slotted spoon and lay on paper towels. Don’t worry if the dumpling are a little sticky. They will firm up as they cool. Continue with the remaining dough balls until all have been poached. 5. Heat a large nonstick skillet over high heat. Add 1-2 tbsp olive oil per batch (1/4 of the dumplings). Add the dumplings, reduce heat to medium and let brown 7-8 minutes before flipping over and browning the other side for another 7-8 minutes. Add additional salt and/or chives to taste. Serve with pasta sauce for dipping if desired. The dumplings are best kept poached but not fried until ready to serve. Dumplings can be stored in a single layer in a sealed container in the refrigerator for 2-3 days. Once fried serve immediately.